Ann arrived at a home where some seven-week-old kittens were available. One of the kittens crawled out from under a sofa where it had been hiding from the kids and came to Ann. She picked her up and the kitten went to sleep in her arms. Easy decision. Sweetie was not overjoyed to meet her new companion at first, as you can see in the photo. They have become great friends over time. Today Ann took Blue to the garden. Blue spotted a wood rat that had been eating the beans (we thought chipmunks were to blame) and ended its existence with a terrier-like shake. She was very proud of her hunt. We are so pleased that this joyous, pretty kitten came to live with us and is also a working garden cat. On April 10 we celebrated Scooter’s 23rd birthday. He dined on rotisserie chicken and was coddled all day. At 23 in human years, Scooter is about 115 years old in cat years. His spirit and Siamese voice are still strong, but his body is wearing out. His legs have lost their spring, his balance is shaky, and his hearing and eyesight are fading. His vet says his kidneys are not working very well and he’s lost two pounds (he only weighed seven pounds before he lost the weight!). 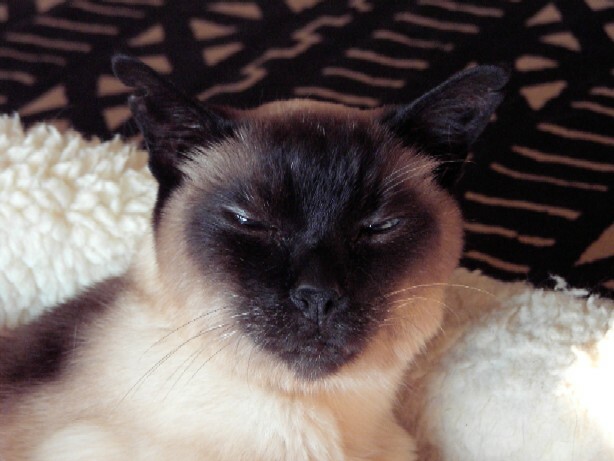 He’s dropped that Siamese royal attitude – when he doesn’t feel well, he’s cranky, but most of the time he’s very sweet and appreciative of the care he receives. On this birthday, some vivid memories always come up. I’m thinking about 10 years ago when he used one of his nine lives. One morning Scooter walked into my office and jumped into my lap, as was his habit (he can’t make that jump now). But something very strange happened: he peed in my lap. I dumped him on the floor and cursed. When Scooter hit the floor, he fell over on his side. I could see that he was breathing very fast. He couldn’t walk. I felt terrible when I realized that he had used all his energy to jump into my lap and he was very ill.
Scooter had received a nasty bite in a cat fight several weeks prior to that day. Scooter defended his territory diligently in those days , which means he fought weekly and was injured regularly. (His territorial boundaries are almost identical to our lot lines.) We hauled Scooter to the emergency vet often to get patched up. I hated going to the emergency vet’s office; waiting for an hour or two in a room with tense, upset people and seeing people bringing their pets in when the pets were often in terrible shape. 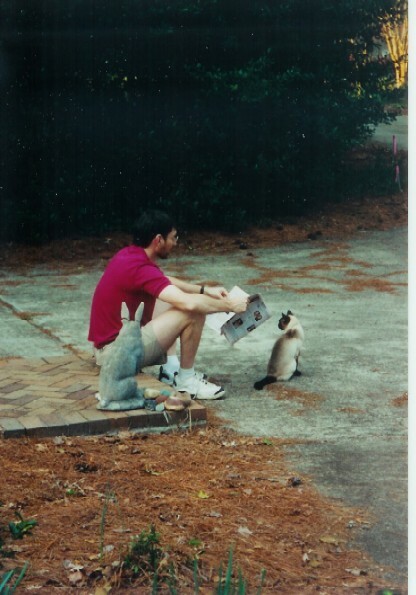 What we didn’t know is that Scooter had received a poisonous bite – the biting cat was a carrier of hemobartonella, a type of infectious anemia that prevents the red blood cells from holding oxygen. We took Scooter to the emergency vet and they said he needed to go into the oxygen cage, which would help him breath. Ann and I went to see him that night and he was barely alive. We could see that the vet assistants didn’t think he would make it through the night. Ann held him and he was breathing very fast, trying to get enough oxygen. We were so sad driving home that we couldn’t talk. Ann was commuting to mid-town for work at that time, so I went to the emergency vet’s office the next morning, expecting the worst. He was "doing better" after spending all night in the oxygen box, much to everyone’s surprise. I took him to the regular vet’s office where they put an IV port in his leg and kept him on an IV all day. I picked him up that evening and brought him home so he could spend the night with us. In the morning I took him back to the vet’s office. We repeated that routine for two weeks. As Scooter grew stronger, he used all his energy while he was home trying to get that IV port out of his leg. 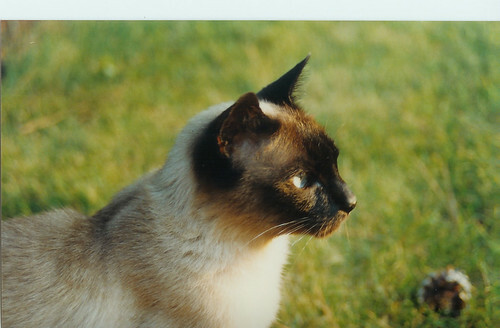 Within a month, Scooter was back: fighting trespassing tom cats, hunting birds and lizards, and yowling as only a Siamese can. Five years later Scooter would nearly lose the fight of his life again (link We All Need Nine Lives). 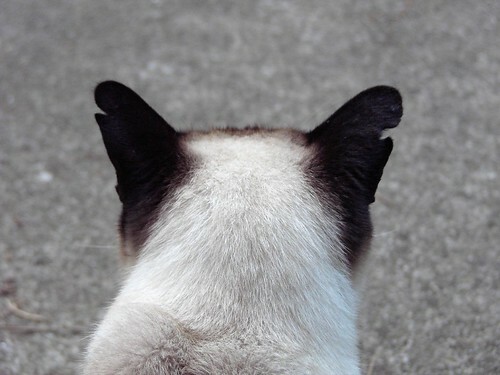 This morning Scooter the Siamese Cat came into my office, yowling at top volume. After I scratched him thoroughly he went to Ann’s office and yowled continuously. She took him outside for a walk. Soon, Scooter was back in my office; I let him sit in my lap for 15 minutes while I worked. Then he went back to Ann’s office; she put him on the deck. Soon he wanted off the deck. He still bounced between our offices, yowling irritably. After about two hours of the squeaky wheel needing grease, we were getting weary and angry with Scooter’s harassment. I rationalized that the bad weather heading our way had him upset. Ann always worries that he is tired of his food. Ann went into our bedroom and happened to glance at Scooter’s bed. She discovered that he had barfed in his bed and had been trying to tell us about it. As soon as his bed was cleaned up, he took a long nap. Anyone have a recipe for crow? I caught Scooter the Siamese Cat hitting the catnip. Apparently it’s too late to just say no (he’s 22 years old). More adventures of Scooter here. I walked into the bathroom at 10am and glanced out of the window into the backyard. A large coyote came out of the woods into our backyard, running at half speed. He cut across our backyard and headed towards the street. I lost sight of him as he passed on the east side of our house. I ran to the garage but I didn’t get to see where he went. Based on his direction, he ran up the walk way in our backyard and between the driveway and the garden. I wonder how often this occurs. It could happen several times a day and we wouldn’t see it very often. I just don’t know if I was fortunate enough to be in the right place at the right time or if it’s a commonplace occurrence. The path the coyote used is a place where Scooter often goes when we take him out. What would have happened if Scooter had been on the path when the coyote came by? Would I have been able to intervene quickly enough to prevent Scooter’s demise?